This set compiles three episodes from the fun and educational REAL WHEELS series. 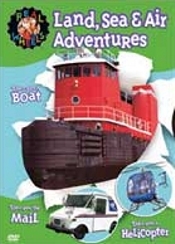 In "There Goes a Boat," Becky and Dave play captain, leading children on a tour of the world of boats, teaching how tugboats tug, how jet fighter planes use ships for landing, and even how submarines work. In "There Goes a Helicopter," Becky and Dave put on their pilot caps for a wild ride inside a helicopter, explaining how helicopters work, and how they are used in many capacities, for police, military, firefighter and rescue missions. In "There Goes the Mail," wacky Becky and Dave are put to the task of delivering the mail, which as viewers will learn, is not as simple as it sounds.